I knew it was coming in the mail. I had been tracking it's progress and kept glancing out the window when I would see "package trucks" (as my kids call them) on our road. You'd think we were expecting some new flat screen TV or video gaming system (is that what they're called? ), but no. We were expecting our box of school books for next year. Of the 31 books pictured here, 21 are books Sam will read on his own, the rest are read alouds. I mentioned that we were thinking about switching curricula this coming year. We settled on Sonlight. I had been looking at Sonlight for two years, but hesitated initially because of the cost. I managed to raise over half of the cost through selling stuff we didn't use any more at consignment and on eBay- this helped significantly. The books we received cover history, language arts, Bible, handwriting, art and music. I had to ask Jamey to carry the box inside it was so heavy. It's good he was home at the time, otherwise we would have all ended up tearing into our box on the front steps of our house (by the way, the box can be turned into a castle- their are cutting lines and instructions on the inside of the box). It really was like Christmas. It was a bit hard for Sam to understand that he is not allowed to read these books- yet. I got excited because I love reading good books to my kids. We are in for a lot of hard work, but the adventures that we will embark on through these books will be worth it. And don't worry- like always, if we read a book we particularly love, I'm going to tell you about it. Sorry this is a weird picture- I couldn't (for the life of me) figure out how to get it all in the picture. We're doing our own math, science and spelling- these books aren't pictured here. You will love Sonlight! I found them easy to use, and I think the focus on great classic (and not-so-classic) books is great! Have a great school year. It would be torture for my kids not to be able to pick up the books and start reading too! I LOVE the series about Rose Wilder; I was crazy about them when I was younger. Also, A Cricket in Time is fabulous. I've devoured Misty of Chincoteague many many times. Arleta Richardson's books are absolute treasures. Sam has many happy hours of reading ahead of him! I'm so excited for you! I wish I would have known you when my children were younger...we would have been "teaching" buddies because, knowing what I know now, I would have homeschooled them. I think you are amazing and I can't wait to follow your adventures this upcoming school year. Your children are VERY blessed to have a mother who genuinely cares about their future. My hat's off to you!! Sonlight is such a great program! 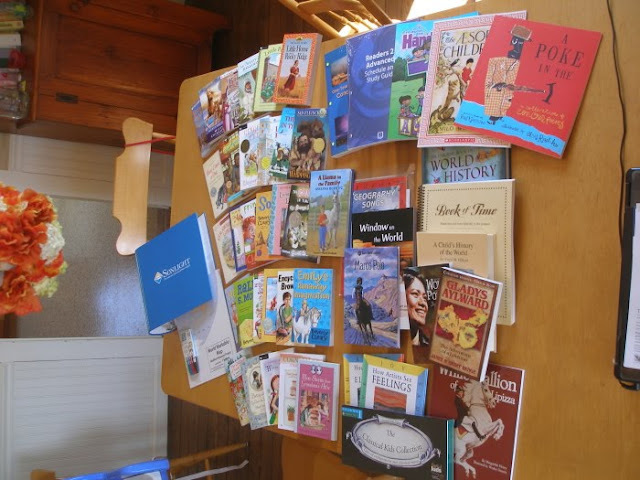 I pretty much design my own program, but use a lot of Sonlight's book choices. I hope you have a great year!!! The Classical Kids series for music is excellent! Good recordings and very kid-friendly, as well as being sound in terms of musical terms, etc. Enjoy the books! The Gladys Aylward book is one of the BEST books I have ever read. It was so exciting to my students when I read it aloud that we decided to rewrite it as a play and perform it for the entire school. That was about 10 years ago and whenever I run into that class of students they all mention the play and Gladys. The whole series is amazing, BTW. Oh, yes. We got 3 books today in the mail today & I just couldn't keep myself from squealing! These books(your excellent pictures show everything I wanted to see and share with other friends)are so appealing, interesting, and make me want to sit down & read everything right now! Can't wait to see the #of pencils for first month of school! Be blessed in your efforts! We love Sonlight too! Sounds like you will have a wonderful year! We did Sonlight for 1st grade, and are going back to it for 4th grade this year. I am so excited!! 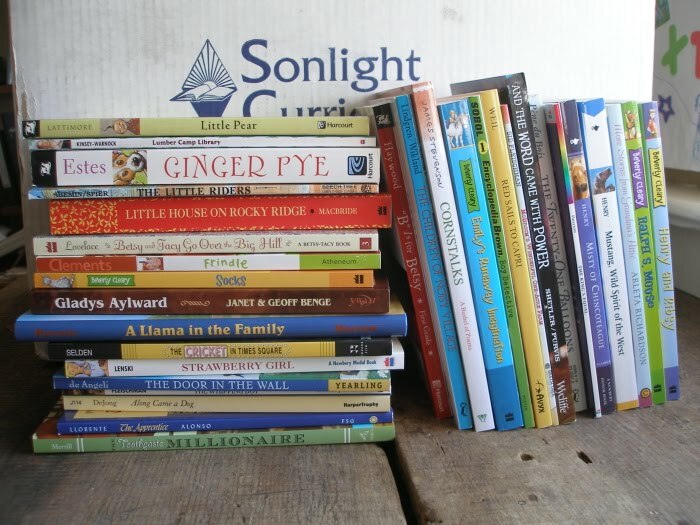 We loved Sonlight when we did it the first year. I read The Cricket in Times Square and Frindle to my students. I love both books! As a teacher, I found Frindle to be especially touching!